Research by academics at the University of Southampton in collaboration with occupational therapy clinicians into the effectiveness of wearing a particular type of silver ring to alleviate symptoms of arthritis has won an award. 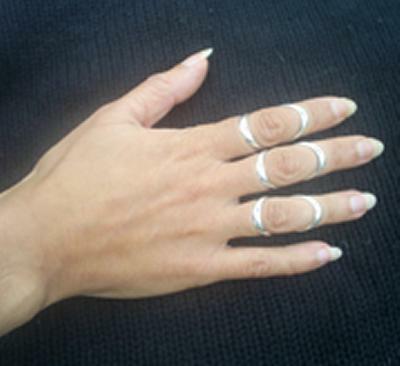 The research, which was carried out by academics in the University's School of Health Professions and Rehabilitation Sciences and the School of Electronics and Computer Science in conjunction with Occupational Therapy at Royal Hampshire County Hospital, Winchester, found that silver ring splints are effective in controlling hyperextension deformity of finger joints, which is common in individuals with Rheumatoid Arthritis. These silver ring splints are elegant rings, which have replaced bulky, plastic ones and are worn to give joints back their stability. They look much better than the plastic ones and are also stronger and more durable. The paper, Three dimensional function motion analysis of silver ring splints in Rheumatoid Arthritis, which was awarded the Arthritis Research Campaign Silver Medal at the British Society of Rheumatology's annual meeting, was honoured for its interdisciplinary approach. The research work was funded by a grant awarded by Wessex Medical Research. The research team consisted of Dr Cheryl Metcalf, an engineer at the University of Southampton's School of Electronics and Computer Science; Caroline Spicka studying for her MSc at the University, and Dr Jo Adams, Professional Lead for Occupational Therapy at the University, and a clinical occupational therapist from Royal Hampshire County Hospital. According to the researchers, the team has worked efficiently together to ensure that the project has fulfilled its remit to carry out innovative scientific research that is applied directly to real issues and concerns that are affecting patients' daily lives. The project has been an excellent example of clinically applied academic research. "This award demonstrates what can be done when people work across disciplines," said Dr Metcalf. "These silver ring splints have been commercially available in different parts of the world for a while. Men and women wear them and they look a lot nicer than the plastic alternatives currently available - which means people are more likely to wear them." An occupational therapist at Royal Hampshire County Hampshire added: "In fact I saw two patients this week who really do appreciate these splints. One is ordering three more for her little finger and both thumbs after having seven silver splints for at least five years for her other fingers. Unfortunately, the other patient can't because her skin is too delicate, but both can see the benefit." With around 500 researchers, and 900 undergraduate students, the School of Electronics and Computer Science at Southampton is one of the world's largest and most successful integrated research groupings, covering Computer Science, Software Engineering, Electronics, and Electrical Engineering. ECS has unrivalled depth and breadth of expertise in world-leading research, new developments and their applications. As one of the UK's top 10 research universities, we offer first-rate opportunities and facilities for study and research across a wide range of subjects in humanities, health, science and engineering. We have over 22,000 students, around 5000 staff, and an annual turnover in the region of £325 million.